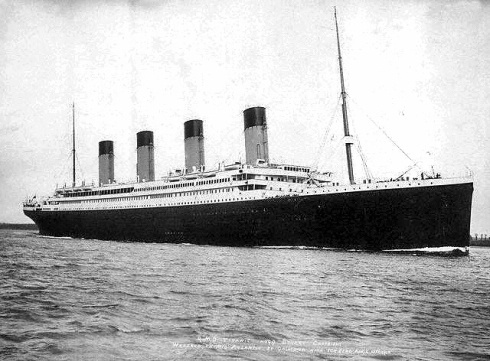 Physics Buzz: Did the Moon Help Launch the Iceberg that Sunk the Titanic? The Titanic had been warned there were icebergs in the area, but its captain, Edward Smith, for whatever reason, decided to ignore the warning. At 11:40 p.m. ship's time, lookout Frederick Fleet shouted, "Iceberg! Right ahead!" The attempt to get out of the way failed, leading to one of the most famous naval disasters in history. But the accident raised several questions that have never been resolved. For instance: what were all those icebergs doing in that part of the ocean in the first place? A team of astronomers thinks they may have an explanation: an alignment of the Earth, moon, and sun in 1912 so rare, it had last happened in the year 796 A.D., and won't happen again until 2257. It's called a perigean spring tide at perihelion, and it happened three months before the Titanic sailed. The study, by Donald Olson and Russell Doescher, forensic astronomers at Texas State University-San Marcos, and Roger Sinnott, senior contributing editor of Sky & Telescope magazine, is in the current issue of the magazine. A spring tide occurs at the new moon and full moon when the sun, Earth, and moon are lined up, which increases tidal forces. When the moon is closest to the Earth, or at its perigee, its gravitational pull on the earth is strongest, and its tidal influence is at its maximum. That happens every half a dozen months or so. But, if the perigean spring tide occurs at the same time the Earth is coincidentally at its perihelion -- closest to the sun -- tidal forces are at their all-time greatest. The first hint this might have happened came more than a decade ago when the late oceanographer Fergus J. Wood suggested in an obscure journal that the moon came unusually close to the Earth on Jan. 4, 1912. It might have produced abnormally high tides and that might have helped launch the iceberg that sank the ship, Wood suggested. His math was off, said Sinnott, and few paid attention. Sinnott, an astronomer, had been interested in Wood's finding for several years, but didn't think anything about the coincidence of the Titanic sinking and the perigean spring tide until Olson mentioned it, he said. 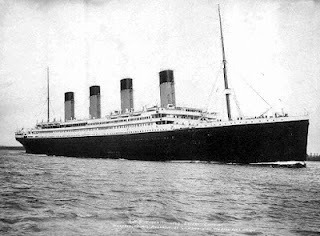 The Titanic set sail from Southampton, England, on April 10 -- three months after the lunar event -- picked up more passengers at Cherbourg, France, and Cobb, Ireland, and then set out across the Atlantic. Most of the ice floating in the Atlantic comes from glaciers in Greenland, which calve, or break at the edges, when they reach the coast, their ends plopping into the water. Tides have an influence on glacial calving, said Tad Pfeffer, an environmental engineering professor at the University of Colorado at Boulder, who studies glaciers in Alaska. It could affect the speed of the calving or the size of the icebergs. Wood speculated that the iceberg that hit the Titanic calved off the night of the extreme tides, Jan. 4, 1912. But, he could not explain how it reached offshore of Newfoundland three months later to meet the ship. Normally, that trip would take more than five months. Olson, Doescher and Sinnott have an explanation, which Pfeffer, who was not part of this research, finds totally plausible. Icebergs born in fjords usually have trouble getting out to the ocean because of a traffic jam at the mouth of the fjord, Pfeffer said. A high tide could have unplugged the entrance, speeding the exit. Icebergs floating around on the Atlantic currents frequently run aground when the water gets shallow, or lodge on a beach as they pass. Eventually, a higher tide lifts them back into the current and they sail on. The tides certainly were high the winter of 1912. "Three things happened fairly close together," Sinnott said. "On Jan. 3, the earth reached its closest point to the sun. The next day the moon went exactly full-phase, and six minutes later, reached the point of its orbit closest to earth." The resulting perigean spring tide at perihelion would have affected the seas for months. The icebergs moved out of the fjords and sailed smoothly on the high Atlantic currents, the scientists wrote. One of them was sitting off Newfoundland three months later when the Titanic steamed toward it.